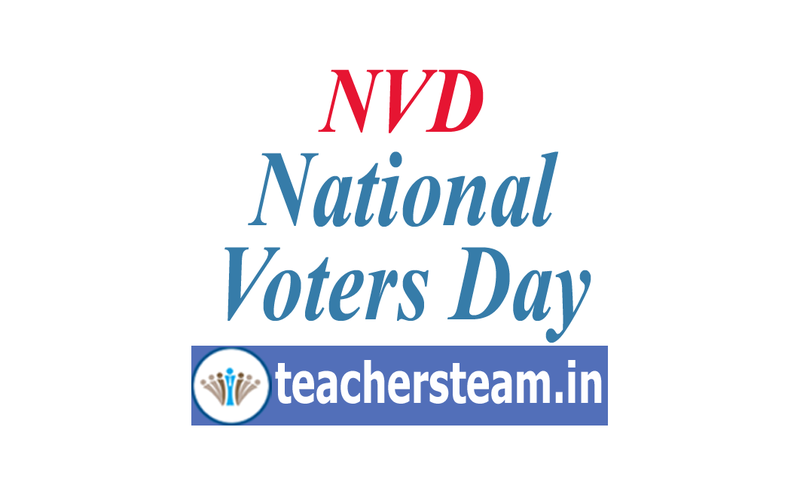 National Voters Day every year, The Commission's objective is to increase the enrolment of voters, by using this occasion so as to make universal adult franchise a complete reality and, thereby, to enhance the quality of Indian democracy. The day will also be utilized to spread awareness among voters regarding effective participation in the electoral process. The Commission in its letter cited has issued instructions on various activities to be undertaken in connection with celebrations of the 9th National Voters' Day, to be held on 25.01 .2019 The theme for the 9th NVD is "NO VOTERS TO BE LEFT BEHIND' and the activities taken up in the buildup to the loksabha elections shall target all segments including womens, youth, Persons with Disabilities, senior citizens, service voters, Overseas lndians besides others marginalized sections of the society. felicitation ceremony along with their EPIC. One of the ECI films on EVMruVPAT shall be shown at the public function, in local language. Other awareness films on Registration, inclusion etc prepared by state & District may also be shown. The DEOs would secure the venue and logistics required for the brief ceremony / public function at each polling station location. The badges will be supplied by this office. The AEROs and EROs of the respective constituency shall participate in the ceremony / public function of those Part(s) under their jurisdiction where largest number of newly registered electors would be felicitated. This function can be combined in respect of all the polling stations located within 2 Klt/s radius of the venue to achieve a high level of impact. The Dastrict Election Officer shall organize appropriate function at the District headquarters, in association with Local bodies, Universities / Engineering Colleges / other academic institutions / civil society organizations / Youth Volunteers' Associations like NSS, NCC, Scouts & Guides, NYKS / Media and Ex-servicemen etc. To popularize the electoral participation and voters' education. Awareness films on Registration, Inclusion etc prepared by ECl, State or District shall be shown in the function at the District Headquarters also. ln this programme EPICs shall be distributed among new voters of the local polling stations combining within a radius of 2 km or so to achieve the high level of impact. Outstandlng performances by ELC Schools and ELC colleges of the district may be felicitated on the occasion. lt shall be ensured that the Chief Guest(s) hand over the EPICs to all newly registered voters (18+), whose Polling Station(s) are covered by the ceremony / function and electors are not made to walk a long distance for this purpose. The CEO shall organize the NVD function at the state capital in association with IVedia, Civil society, opinion groups, youth volunteers Group, State Administration, State Election commission and Corporate etc., further state Awards shall be handed out in the functions. The DEOs shall send the nominations for felicitating the ELCs, which have done outstanding performance in schools & colleges along with detailed justification and activates taken up by the ELCs. Representatives of all political parties shall be invited to the celebration of the NVD at every level in addition to other stakeholders. Deployment of dedicated staff at Mandal, Sub-division and District levels shall be undertaken with complete responsibility for guidance / coordination, for celebrations and reporting of all the NVD related activities effectively BLOs shall be trained at the [r/andal Headquarters / Constituency level about their role for NVD activities by the Designated Officer / EROs / AEROs well in advance. Sensitization of the BLOs towards registration of women voters may be taken up during training. undertaken. Collaboration with NGOs, CSOs, Government Departments, PSUs and Corporate for reaching out to and actively engaging these groups shall be taken. "Young Voter's Festival" through competitions in all Higher Secondary Schools and Higher Educational lnstitutions, l.e. Colleges, P G. Centers and Universities shall be organized by DEO to serve as a build-up to NVD-2019 The competitions both at Junior Level and Senior Level will be, Elocution & Essay writing, which will be organized at Constituency, District and State Level on 18.01.2019, 21 .01 .2019 and 24.01 .2019 respectively? Rangoli competition shall be organized at Polling Station Location level on 25.01 .2019. Attractive prizes shall be given to the winners of the competitions at Polling Station Location (Rangoli) Constituency, District and State levels (in respect of 4 competitions) The District and State level winning entries (1"t, 2nd & 3'd) will be showcased along with the photograph on CEOs website / You Tube. Certificates shall also be awarded to all the winners. lssue of instructions to BLOs to keep Forms 6, 7, B & 8A available at all the Polling Station Locations on 25.01 2019 for distribution and also collection of forms and photographs, whoever wants to submit applications / new / latest photographs during the NVD celebrations. The students of Upper Primary Schools, High Schools and lntermediate shall be grouped as Junior level and the students from undergraduate level onwards shall be treated as Senior level. Competitions for both junior and senior level students shall be conducted separately in 2 events each viz., Elocution & Essay Writing. participants and their scores, event wise and furnish along with the entry sheets to the respective Assistant Electoral Registration Officer (Tahsildar) / Electoral Registration Officer (Revenue Divisional Officer/Deputy Collector), whoever is in proximity. The DEOs shall send the list of participants for State level competitions and the Officer accompanying them to DEO, Hyderabad and this office by fax on 21.01.2019 for making necessary arrangements. The District Election Officer shall organize the District Level Competitions at District Headquarter. The time and venue of competitions shall be informed to all the participants well in advance. competitions and their attendants (i.e.,5 x 31 = 155 participants) and transportation for their participation in State Level functions at Ravindra Bharathi on 25.01 .2019. The District Election Officers shall also send the information in the enclosed NVD reporting format twice - first report by 10.01.2019 and second by 31.01.2019, so as to furnish the consolidated information to the Commission and also to upload the same on ECI web site.